Inspired by a pastel sketch I did in November last year at school. I decided to take it further and did a large oil painting. I liked my composition of the 3 women, and decided to call the new one ‘Looking Back’. The woman in the foreground is observing and reflecting on her life: the 3 stages of womanhood, youth, adulthood and finally maturity. My painting ‘3 Mile End’ depicts a personal allegory. The environment is Mile End, and my partner is reflecting over our life’s path together. 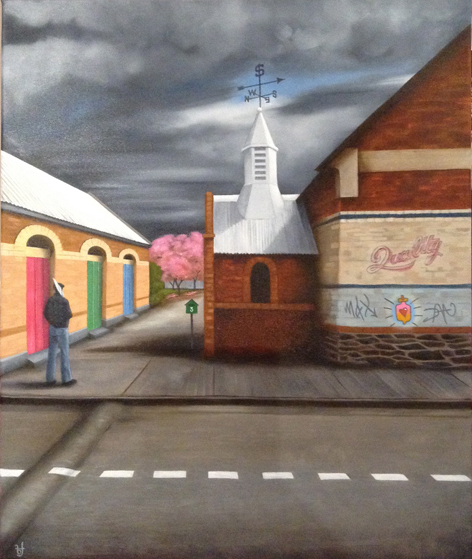 Umbrella in hand, the storm is brewing, ominous and dark, but there is a ray of light shining though the clouds onto the church steeple, and the hall on the left. The symbolic religious cross on the defunct church has been replaced with a domestic weather vein and a $ symbol pointing south. 3 graffiti tags on the building are by the 3 most important people in my life (my sons & daughter in law) which I asked them to do specifically for the image. Max, Dan, Zoe (the hot water bottle of love) all have 3 letters in their name. They are drawn over a rock foundation, representing their solidity in my life. The domestic letter box at the entry to the church also has the numeral 3. The church represents domesticity, the spirituality and sanctity of marriage. The 3 doors represent the 3 properties in my life,….which one will I / he enter now? The 3 blossom trees with the leaves falling, again represent 3 pink Italian rendered houses, a shedding of necessity. As he looks back down the path, and over his life,… will he keep walking? Or will he cross the line? They say things happen in 3’s….